Most websites will tell you the same thing - Karon beach is Phuket's "second most developed" beach, but is quite spread out with many resorts along the beach road, generally does not feel too crowded, it much cleaner and neater than Patong and the sand is squeaky - I read this and thought "yeh, right", but the dry sand does squeak, it's true! The beach is long and open (if you want a pretty curving bay, then try Kata or Naiharn). In some places there is shade, in other places the beach is hot - but of course you can find beach chairs with umbrellas everywhere in the high season. 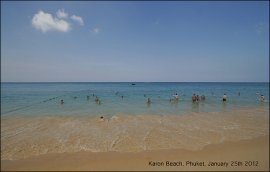 Karon Beach is more than 3km from end to end. 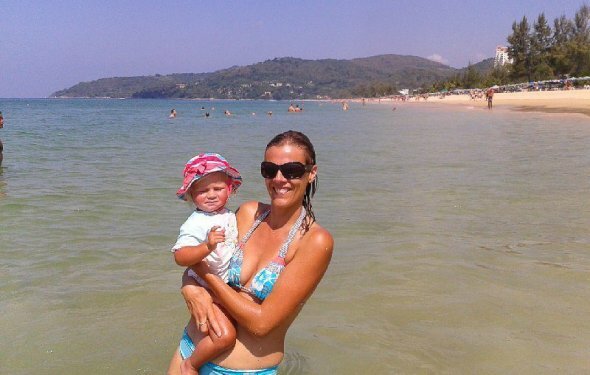 Unlike parts of Patong, there is virtually no development right on the beach. For much of the length of Karon beach, there is a road, a path for walking, some greenery and a canal in between the beach and the hotels. Only hotels right on the beach are the Beyond Resort, Marina Phuket and Ruam Thep Inn (south end) and an odd little place called "In On The Beach" at the north end. 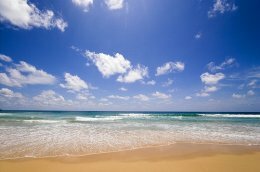 The beach is quite green, the sand is clean and fine and from most hotels you are no more than a few minutes from the water. 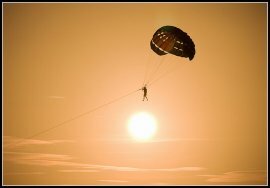 Karon beach is about an hour from the airport, 15 minutes from Patong or 10 minutes from Chalong Jetty. 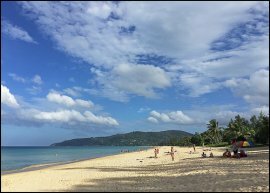 If you like a quiet beach, but some nightlife, Karon is ideal - you can head into Patong in the night - Karon has a few bars, but nothing serious. It does tend to be more of a family beach, and the accommodation reflects this. Most of the beach road is taken up with resorts - some huge like the Hilton or Thavorn Beach resort, some a bit smaller like Karon Princess or Karonburi. Cross the road and you're at the beach! Off the beach road there is a profusion of small hotels and guesthouses like Karon Place, Bamboo House, Casa Brazil, Pineapple Guesthouse - many, many options and all just a few minutes from the beach. Just about any kind of room you want can be found around Karon - from 200 Baht dorm rooms to 5 star luxury. 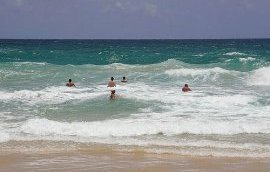 Some hotel links at the end of this page, or I suggest that you check Agoda.com for lots of hotel information and rates or look at my suggested Karon beach hotels. 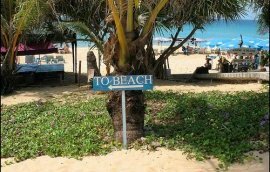 Similarly, there are plenty of eating options around Karon beach. The resorts have some nice restaurants, there are steakhouses like Buffalo Steakhouse or Angus O'Tools, there is seafood galore and also many small family restaurants for Thai food. If you want good, cheap local food get off the beach road and look along "Patak Road" (the back road), where you can find where the locals eat.. yes, there are locals here - fishing folk mostly, and you still see fishermen at the beach, or longtail boats going out fishing. 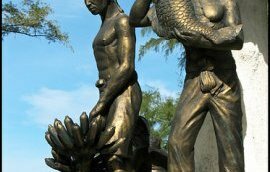 These days, many of the local families now run guesthouses or restaurants rather than relying totally on fishing for a living.